OF COURSE I'm going to read it. Okay, maybe not. 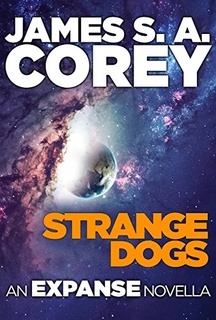 I read this one because it was an Expanse book, knowing it might not have Holden in the plot. It didn't. I didn't find the main character particularly compelling, so this book took me a little longer to read than the Holden books do, even though it's a novella instead of a full novel. The book is an on-the-ground, back story on one of the planets through the Ring. It left more questions than it exposed with the characters and dialogue, which might be the point of it, as a lead-in into the next book. At this point, if not a hard-core, I'm-going-to-read-everything-Expanse fan, skip this one. Her mother said that honey was better than molasses, but there weren’t any bees on Laconia. Cara had only ever seen pictures of them, and based on those, she didn’t like honey at all. I giggled at this when I read it. Small children often don't like foods just because they are different from what they know. Except that adults do this, too, and spend a large amount of effort justifying why they don't like something, when, in reality, they don't know enough to know they don't like said something. The focus of the family spotlight had moved past her. Momma bird was over. She couldn’t put her thumb on why that bothered her. One of the hardest things about death is that life goes on. She wondered if the windowless room was like being on a spaceship. Months or years without ever once going outside or hearing the rain tapping into puddles or being able to get away from Xan and her parents. Never being alone. Never feeling the sunlight on her face. Nothing changing. Nothing new. It sounded awful. Oh, wow, yes, that would be awful, never having Alone Time. She wondered if the dogs would want to be captured and studied. She thought not, and they’d already done more for her than the soldiers ever had. Who is good and who is bad is often based on which perspective you see first. Not always, as some whos and many acts are simply evil. Excepting the obvious of those, who helped you, who talked with you first, who you interacted with last, these influence which side you end up on quite a bit. The strangest thing was how normal they sounded. How much grief sounded like regular life. Again, one of the hardest things about death is that life goes on. Night on Earth was bright. That’s what they said. Their moon shone like a kind of second, crappy sun. Cities were big enough to drown out the stars with their extra glow. Cara dropped to her knees and threw her arms around the dog, hugging the strange, too-solid flesh close to her. It was warm against her cheek, and rough. It smelled like cardamom and soil. It went still, like it wasn’t sure what do with her affection and joy, and it stayed still until she released it. This scene reminded me of Bella, and of Chase. Both of those dogs were/are incredibly tolerant of my snuggling them. There wasn’t a perfect answer, but she didn’t need a perfect one. Good enough was good enough. Making her way home was harder than leaving had been, which made some sense to her. Going away from a point, there were any number of paths, and all of them were right. Going back to the point, most paths were wrong.